Good things take time, and Cosmo Celebration Sauces are no exception. Our recipes began taking shape long ago in the Italian coastal town of Gaeta. As time went by, those recipes only got better with each kitchen they passed through on their journey. 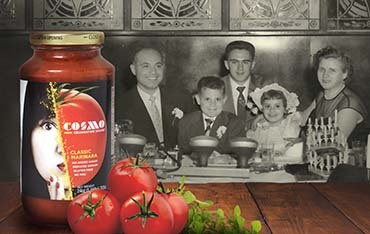 Cosmo Celebration Sauces capture the time and patience of five generations and prove that real Italian can be real easy. Every time a jar of our sauce is opened, you’re creating your own celebration. 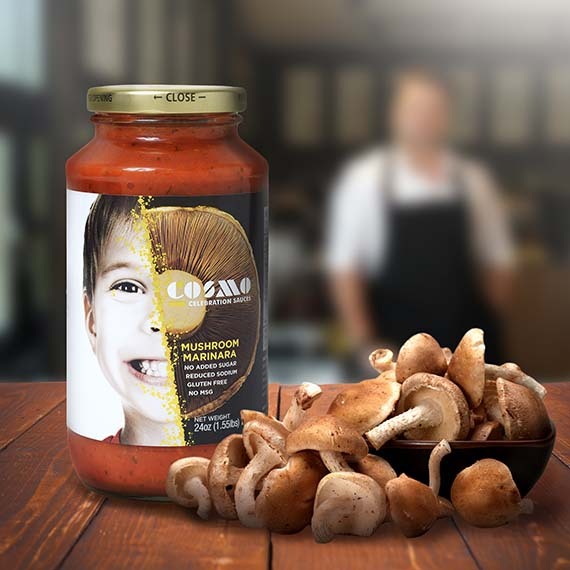 Whether it’s a Sunday dinner for the entire family or a quick moment on a busy night, Cosmo Celebration Sauce is there to give you the best combination of flavor, nutrition and tradition. Now, go for the gusto – heat the sauce and let it simmer on the stove top. take a deep breath and smell the full flavor and aroma. Let the celebration begin! Tomatoes and onions and garlic, oh my! It’s amoré at first bite. Our secret blend of herbs and spices, pure olive oil and the finest, freshest ingredients make this your go-to sauce. Marinara means “the sauce of sailors,” originating in Naples, Italy, in the 16th century after the Spaniards introduced the tomato to their European neighbors (thank goodness!). You might say the rest is history. Share our 5th generation family recipe generously (and often) with those you love. It’s “A Celebration in Every Jar.™” Festeggiamo! Who says treasure doesn’t grow on trees? The exotic Shiitake mushroom does. Revered for centuries for its health-giving benefits, the Shiitake joins the ranks of today’s superfoods. Its undeniable smoky flavor adds depth to whatever it’s paired with. For all our fans that told us sauce just isn’t sauce without a liberal dose of ‘shrooms, this is for you. Cosmo’s family recipe will make your taste buds think you’re in Italy. Simply open, simmer and savor. Delizioso! It’s good! It makes my mouth feel full of happiness! Since I was a culinary student at Johnson & Wales University some 20 years ago, I’ve made many sauces and the key ingredient is always authenticity. 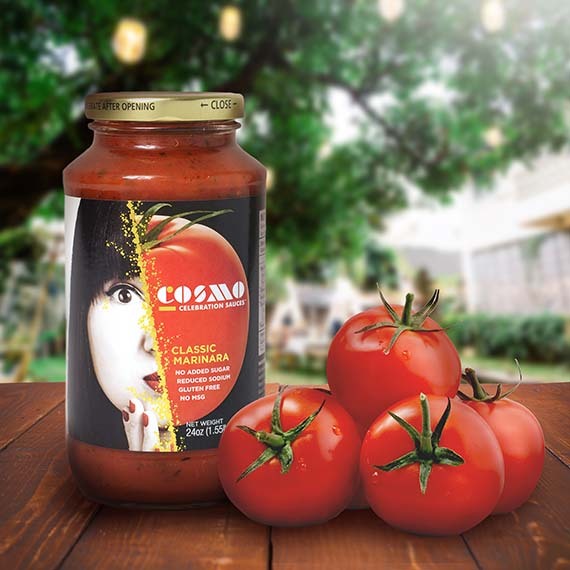 Cosmo Celebration Sauces are real, classic Italian sauces that taste homemade with the perfect balance of flavors. I’d gladly use them on dishes I prepare for my family and friends. The vegan Classic Marinara Sauce from Cosmo Celebration Sauces brought my taste buds back to Italy. In a word: delizioso! Part of what makes Cosmo Celebration Sauces special is sharing. We’d love to hear your stories, recipes or even a kind word about how you enjoy our sauce (we might even quote you). In return we’ll keep in touch about special offers, contests, new products and our favorite new flavors. Keep me informed of all sauce-related news.